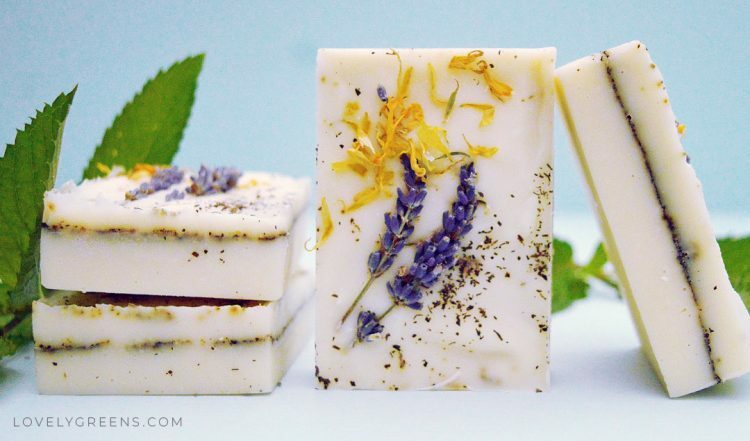 This may be the prettiest herbal soap recipe I’ve created and I’m pleased to share it with you. The recipe is all-natural, free from palm oil, and beautifully scented and decorated. When blended together, lavender, peppermint, and marjoram make such a pleasant and sweet scent combo. The flower decorations compliment oils mixed into the soap too — dried calendula flowers for the calendula oil, lavender stems for lavender essential oil, and crushed peppermint for the peppermint essential oil. I finished off the look with a fine line of crushed peppermint leaves running down the middle of the bars. 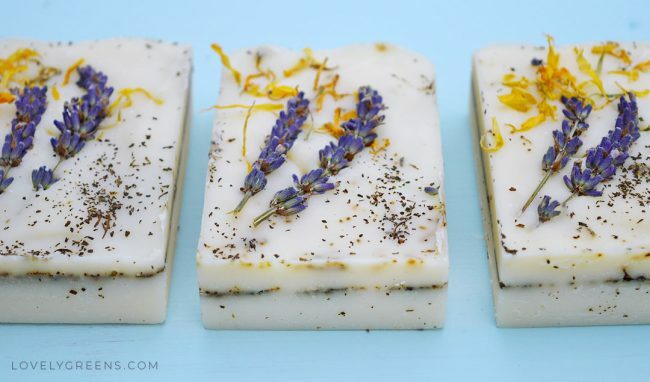 There’s a story behind this herbal soap recipe. 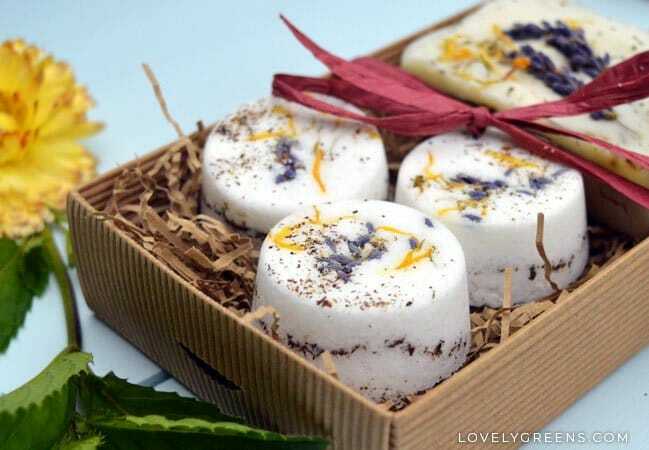 Not that long ago I showed you how to make pretty herbal bath fizzies. I loved them so much that I used them as inspiration to make a matching soap recipe. 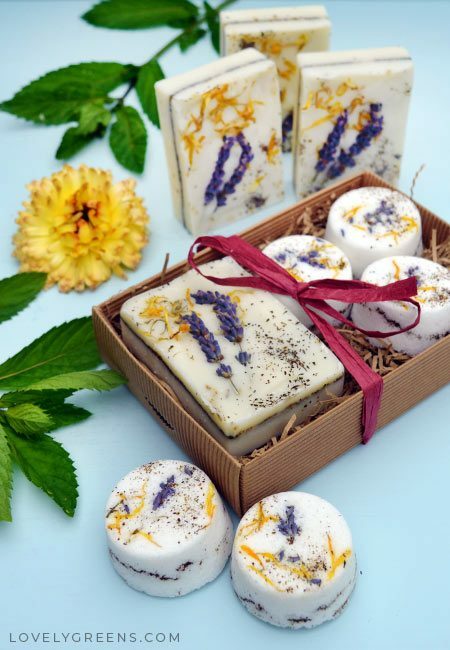 Both the fizzies and the handmade soap are made with the same dried herbs and gorgeous blend of essential oils. 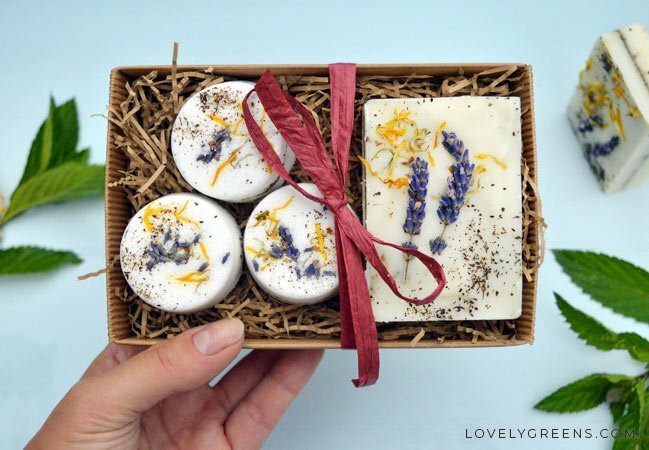 Though you could make the fizzies or the soap on its own, the idea is that you could make both and give them out as gifts. Imagine how delighted friends will be to receive a handmade bar of soap and two to three fizzies. 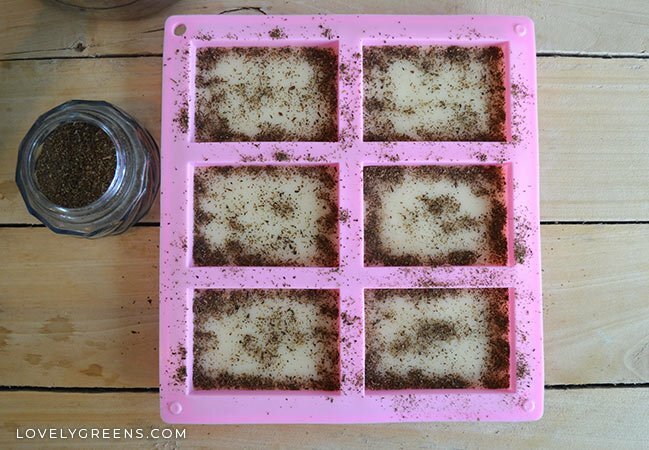 This recipe for herb garden soap will make six bars that are about 90-100g each. The essential oil blend is pleasantly herbal but any sharpness from the peppermint is softened by the lavender and marjoram oils. 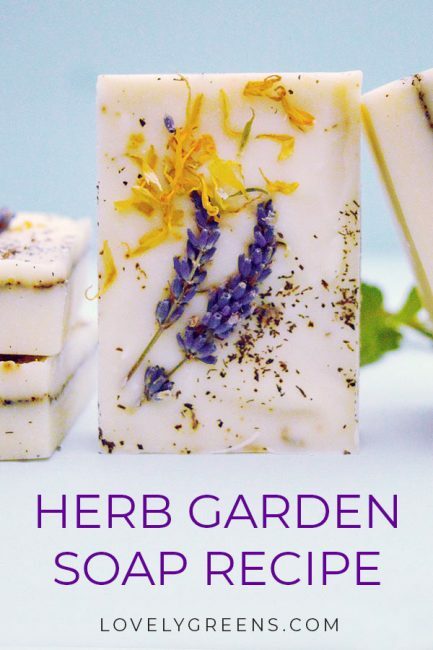 This is a herbal soap that invigorates the senses while being soft and feminine. * Instructions on how to infuse oil with calendula flowers is about half way down on this page. You can also purchase it pre-made. If you’re new to making handmade soap, you should check out my four-part series on natural soap making. It gives a good introduction on what to expect from ingredients, equipment, recipes, and how to combine everything together to make soap. It’s especially important to be careful when handling lye and part 2 below will tell you what to expect. Lye isn’t something to be scared about using but you should know how to handle it safely. I’ve also put together a video on how to make lemongrass soap — the process is very similar to making this recipe so have a watch of the video below. It shows a lot of the same steps as well as what ‘Trace’ looks like. The first thing you should do is pre-measure all of your ingredients and have your work space set out. 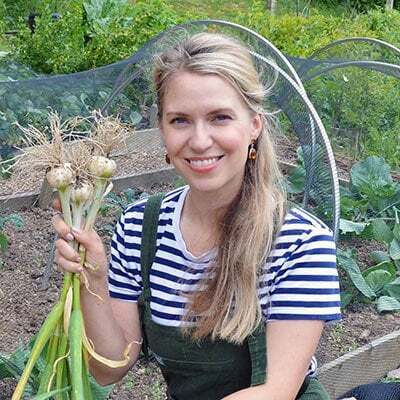 Have your solid oils measured into a stainless steel pan, the dried lye in a heat-proof jug, the water also in a heat-proof jug, and the liquid oils measured into a bowl. The essential oils to add after trace can be measured out later on in the process but also pre-measure the calendula oil. It should be in its own ramekin or small bowl. Have a rubber spatula and your soap mould(s) set out and ready to go. Also, try to work undistracted. There are a lot of steps and it’s best to work without interuption. Pets and kids out of the room and make sure to wear an apron and closed toe shoes. Wear rubber gloves ane eye protection when handling the lye or soap batter. Now let’s get soaping! I tend to do this step standing in the doorway. It’s important to not breathe the steam in from this step so work in a ventilated space. Work next to an open window, door, or better yet, on a table outside. Pour the lye crystals into the water and stir it with your spatula. It gets hot during this step and a lot of steam will come rolling off the surface. When you’re sure the lye is dissolved, set the jug into some water you’ve run into the sink or a basin. The cool water will help the lye-water to cool down. Put the pan on the hob and turn it on to the lowest setting. 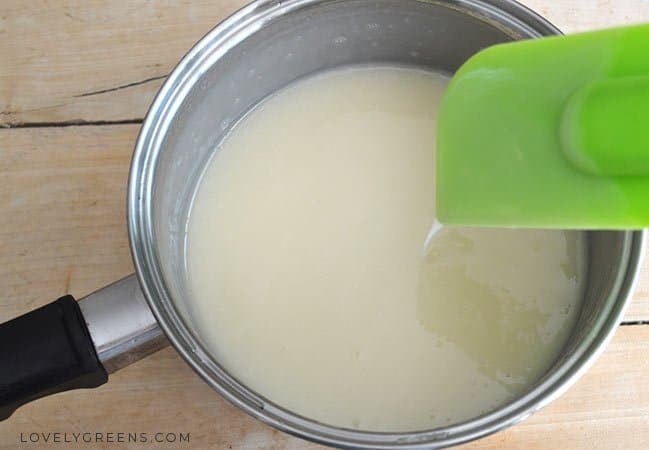 Rinse the spatula off and use it to stir and break up the solid oils — this will help it to melt quicker. You can use the spatula for both your lye-water and oils, just rinse it each time you move from one to the other. Take the pan off the heat when the solid oils are nearly melted and there are just a few floaters. Stir it a minute or so to allow these last pieces to melt. Next, pour the liquid oils into the pan and make sure to scrape the bowl out well. Castor oil is thick and sticky and needs help getting into the pan. Stir the oils together and take its temperature. For years I used a digital thermometer but I now use a Temperature Gun. It’s so much quicker and easier. You’re aiming to have both the pot of oil and the lye-water to be within five degrees of each other. You also want them down to about 100-105°F (38-41°C). 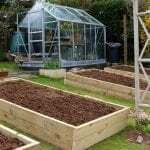 The oils you can heat and cool easier so you’ll need to work around the temperature of the lye water. When they’re in the same range, pour the lye-water through the fine mesh strainer and into the pan. Insert the head of your stick (immersion) blender into the oils/lye-water at an angle. This is to reduce the air in the head and thus air bubbles in your soap. Use the stick blender as a spoon at first and stir gently. Bring the stick blender to the centre of the pan and press it against the bottom. Turn the blender on for 2-3 seconds at a stand-still and then turn it off and stir again. Repeat these two steps until the batter starts to thicken up to a light ‘Trace’. Also, the reason that I advise keeping the stick blender still while it’s on is to reduce the chance of splattering. You know when you’ve hit a light Trace when the batter thickens to the consistency of runny yoghurt. After the batter has reached Trace, measure in the essential oils and pour in the calendula oil. Stir together well. 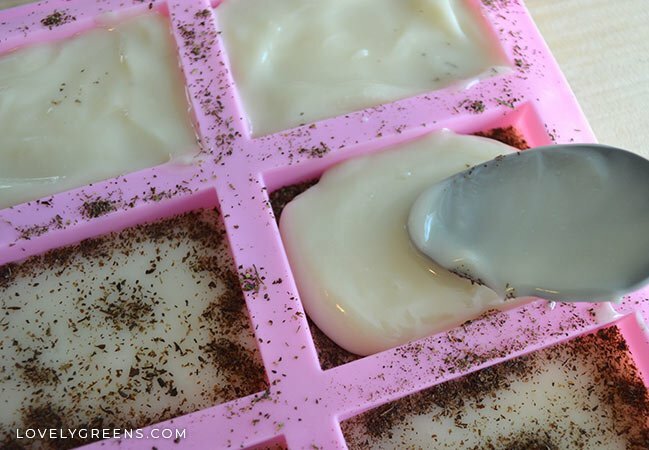 Fill the cavities in your soap mould half-way with soap batter. 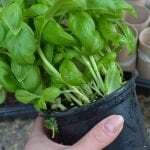 Take pinches of the finely crushed peppermint leaves and sprinkle them on top, especially around the edges. Using a spoon that will forever be used only for crafts and soap making, gently spoon soap batter on top. It will have thickened quite a bit more at this stage. Spread the batter so that it gets into the corners — do it by pushing the batter with the spoon rather than plopping it on. You might get air trapped underneath, and air pockets, if you plop rather than push. 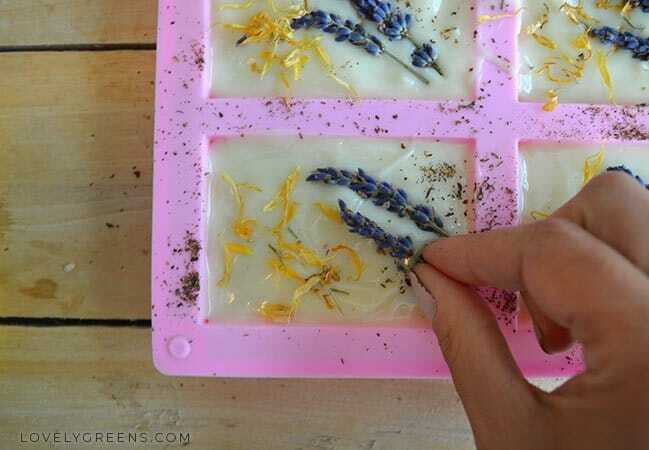 Decorate the tops of your herbal soap using the dried peppermint, calendula, and lavender stems. When finished, leave the soap uncovered and undisturbed on your work space for at least a day. It’s better that you leave it for 48 hours though since this is the amount of time it takes for the lye to completely react with the oils. As for shelf-life, soap can last up to two years. It’s all down to the specific ingredients you use though — look at all your bottles and see when the nearest best-by date is. That’s the best-by date of your soaps. It pays to start with fresh ingredients, especially if you’re wanting to make these ahead and give them away during the holidays. 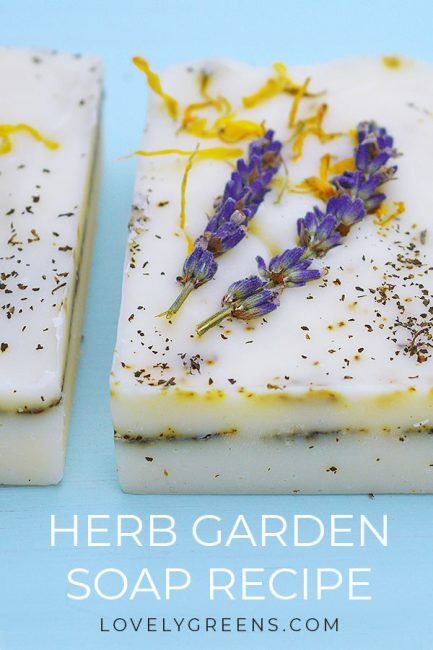 If you enjoyed this tutorial, have a browse through the other soap recipes on Lovely Greens. 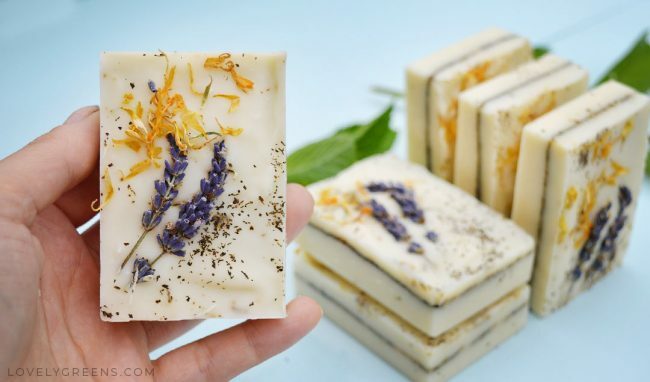 I have a piece dedicated to tips on using dried flowers and herbs in soap making along with a host of other soap making ideas. Do keep in mind to make these along with their matching bath fizzies too. These soaps are so pretty! Fantastic tutorial too!